Introduction: Radioiodine (I-131) therapy is the definitive treatment of toxic multinodular goiter (TMNG). Treatment failure may result in relapse after I-131 therapy. The present study was undertaken to reduce treatment failure rate of I-131 therapy in TMNG patients. Materials and Methods: Multiple causes may have lead to treatment failure of I-131 in TMNG patients making it difficult to establish a direct cause--effect relationship and take corrective action. 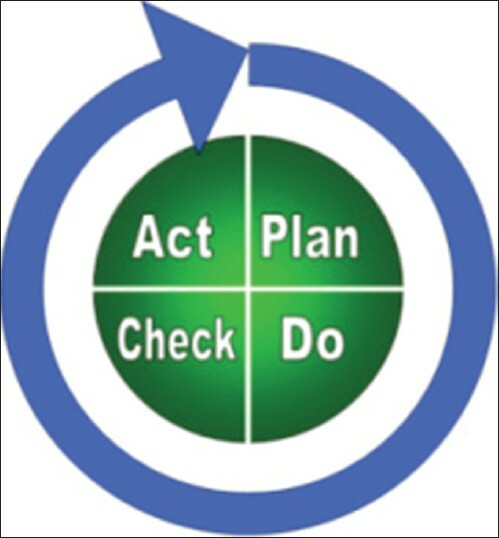 Therefore, the JURAN methodology of quality improvement was applied. The treatment failure rate in 80 TMNG patients treated with I-131 in the period 2003--06 was 29%. The root cause analysis identified delay in decision to radioablate and concomitant antithyroid drugs (ATD) with I-131 therapy as factors leading to relapse. In 2007, a change in management was introduced with decision to radioablate all TMNG patients not remitting at 1 year of ATD and to withdraw ATD for 2 weeks prior to I-131 therapy. A total of 63 patients of TMNG followed the changed protocol between 2007 and 2009. Further analysis showed that one of the factors identified in the initial brainstorming (high iodide pool in the patient) had not been addressed in the protocol currently followed. The protocol was modified to include patient preparation and implemented after standardization. Results: The post-I-131 relapse rate in patients treated after implementation of the new protocol from 2007 to 2009 was 18% which further reduced to 16% in 2011 after modification of the protocol. Conclusion: The failure rate of I-131 therapy in TMNG reduced from 29% to 16% through standardization of the treatment procedure achieved by the use of Juran Methodology that helped to identify process-related defects. Purpose: Lung perfusion scan provides a map of the spatial distribution of lung perfusion. This can be used to design radiation portals to spare functional lung (FL), potentially reducing lung toxicity. The purpose of this study was to assess the utility of lung perfusion single photon emission computed tomography (SPECT) in treatment planning for lung cancer patients. Materials and Methods: Radiotherapy treatment planning computed tomography (CT) scans and SPECT scans of 11 patients of lung cancer suitable for external radiotherapy were co-registered. Conventional treatment plans (anatomic plan) and plans with FL information (functional plan) was generated. The difference in dose volume parameters (V 20 , V 30 and mean lung doses) due to these two plans were compared using Bland-Altman plots. Results: Functional plans produced a more favorable plan compared with anatomic plan in all except three cases. FL V 20 values and FL mean lung dose were reduced for all patients by an average of 5.45 Gy and 7.72 Gy respectively which were statistically significant. Conclusions: Lung perfusion scans provide functional information which is not provided by CT scans. SPECT-guidance aids in reducing the dose delivered to highly perfused regions which could reduce the incidence of pneumonitis. Objective: The aim of the study was to evaluate the salivary gland dysfunction in a patient with uncontrolled type 2 diabetes using salivary gland scintigraphy. Materials and Methods: patients included in the study were 32 uncontrolled type 2 diabetic and 30 normal healthy individuals. Patients having any other systemic(or) nervous illness(or) taking medications that could affect the normal functioning of the salivary gland were excluded from the study. 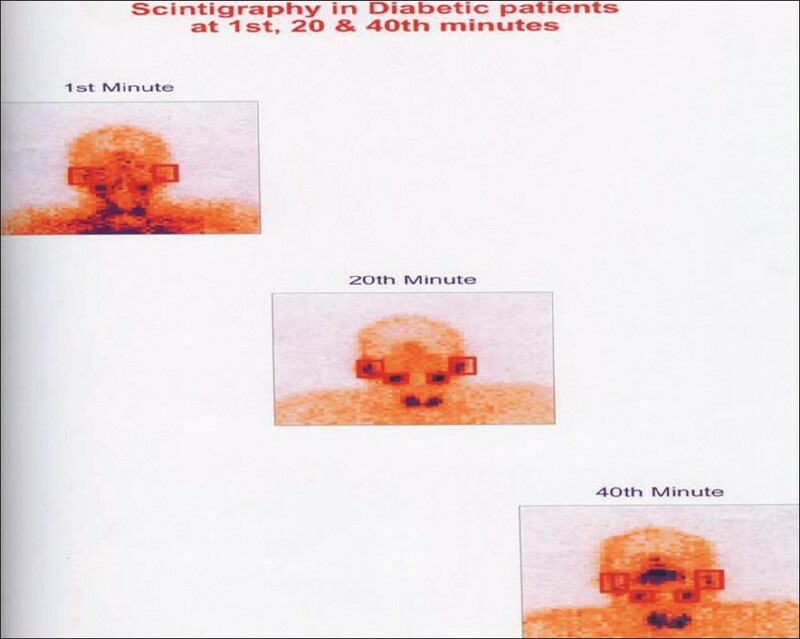 The salivary gland scintigraphy was performed, with radioactivity measured at 1 st , 20 th , and 40 th minutes. Twenty minutes after the injection, vitamin C chewable tablet was given to stimulate the secretion and continued until the end of the study period (40min).The data were replayed and regions of interest were chosen over four salivary glands to obtain the uptake ratio (UR) and excretory ratio(ER) of the salivary glands. Result: The scintigraphic total URand ER in diabetic and control groups was compared. The values in these two categories showed decrease in both UR and ER in diabetic patients, when compared to control patients. Conclusion and Significance: The result of this study suggests that salivary gland scintigraphy plays a significant role in the evaluation of salivary gland dysfunction in type 2 diabetic patients. Purpose: We aimed to investigate whether administration of benzodiazepines decreases the efficacy of fluorine-18 fluorodeoxyglucose positron emission tomography/computed tomography PET/CT) ( 18 F-FDG-PET/CT) dual-phase imaging. 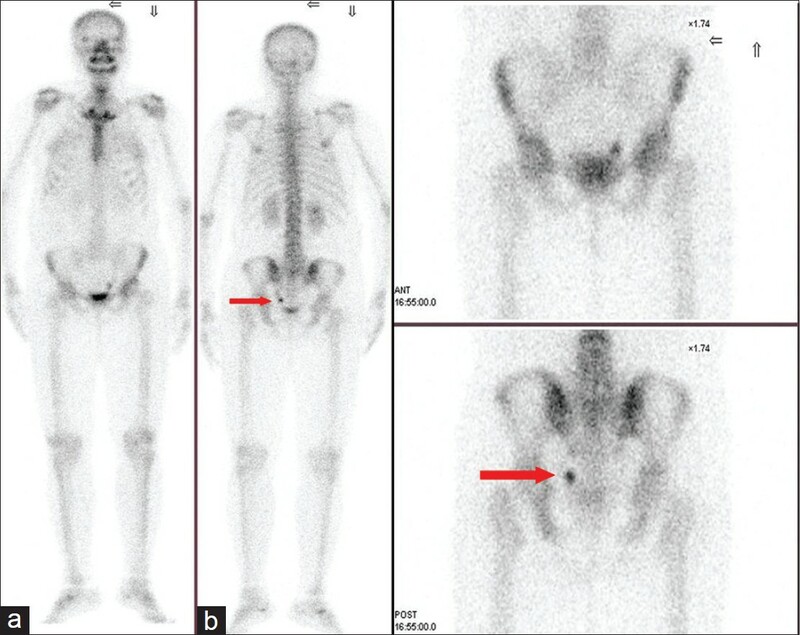 Materials and Methods: Eighteen patients with malignant tumors who were administered 0.5 mg alprazolam before undergoing 18 F-FDG-PET/CT scan (group A) and 21 patients with malignant tumors who were not administered alprazolam before 18 F-FDG-PET/CT scan (group B) were included in this study. Forty lesions from the 18 patients in group A and 66 lesions from the 21 patients in group B were evaluated. 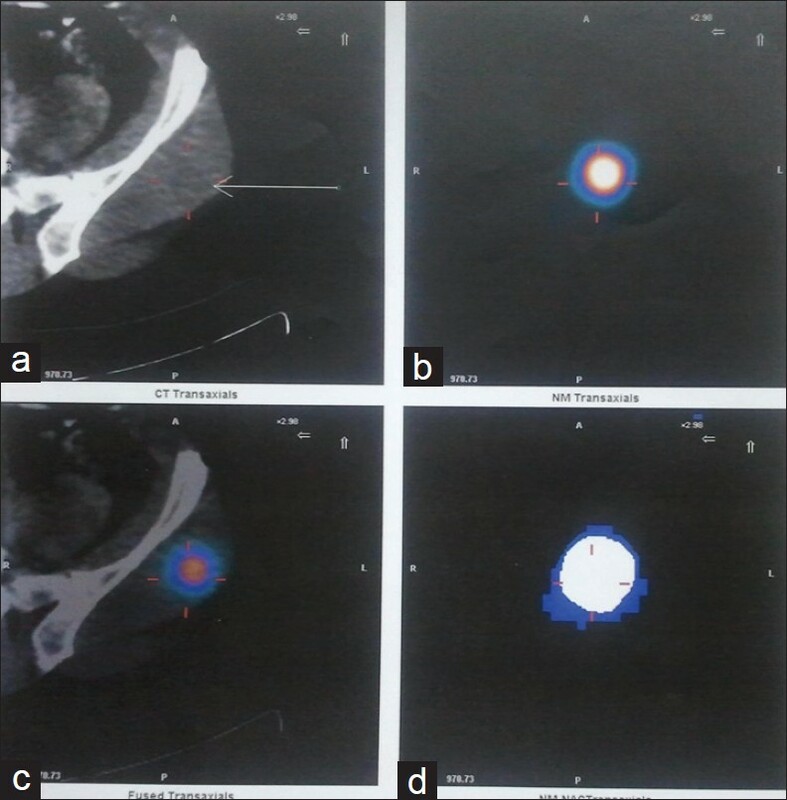 Initial "early" whole-body imaging commenced 60 ± 5 minutes after injection of 18 F-FDG and "delayed" scan was obtained 120 ± 10 minutes after the injection. Maximum standardized uptake values (SUVs) were obtained by drawing three-dimensional regions of interest (ROIs) around each lesion on the early study and the corresponding lesion on the delayed study. Results: The average SUV max in lesions in group A (mean ± S.D.) was 10.2 ± 6.4 on early examination (SUV max E) and 12.6 ± 7.6 on delayed examination (SUV max D). There was a significant difference between these two time points ( P < 0.05). Similarly, for the lesions in group B, the average uptake values were 9.3 ± 5.2 (SUV max E) and 11.2 ± 6.5 (SUV max D). The increase in these values was significant as it was in group A ( P < 0.05). Differences between groups A and B for the variables SUV max E, SUV max D were not significant statistically ( P > 0.05). Conclusion: Benzodiazepines do not adversely affect the efficacy of the dual-phase FDG-PET imaging technique. 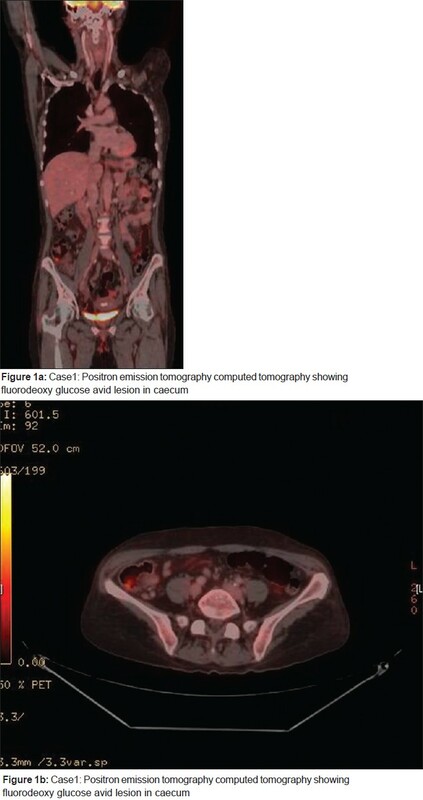 Fluorodeoxy glucose positron emission tomography/computed tomography (FDG PET/CT) is increasingly being used for diagnosing various malignancies and surveillance of cancer recurrence, staging and screening in high-risk individuals. Due to its high sensitivity in picking up small dysplastic lesions, incidental lesions are detected frequently. We present two patients who underwent PET CT as part of cancer screening and were incidentally detected with adenomatous colonic polyps. Colonoscopy and biopsy confirmed the diagnosis. Inflammatory breast cancer (IBC) is the most aggressive form of locally advanced breast cancer. We present here 18 F FDG PET/CT findings of two patients with IBC. 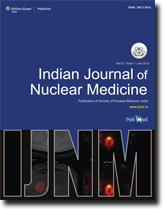 These patients were referred to the Nuclear Medicine department for staging of IBC. FDG PET/CT images showed diffuse infiltration of breasts with multiple lymph nodes and multiple metastases in whole-body PET/CT images. FDG PET provides additional information regarding lymph nodes or distant metastases in the initial evaluation of IBC. Neuroendocrine tumors of pancreas are relatively rare neoplasms and are classified as either functioning or non-functioning tumors. 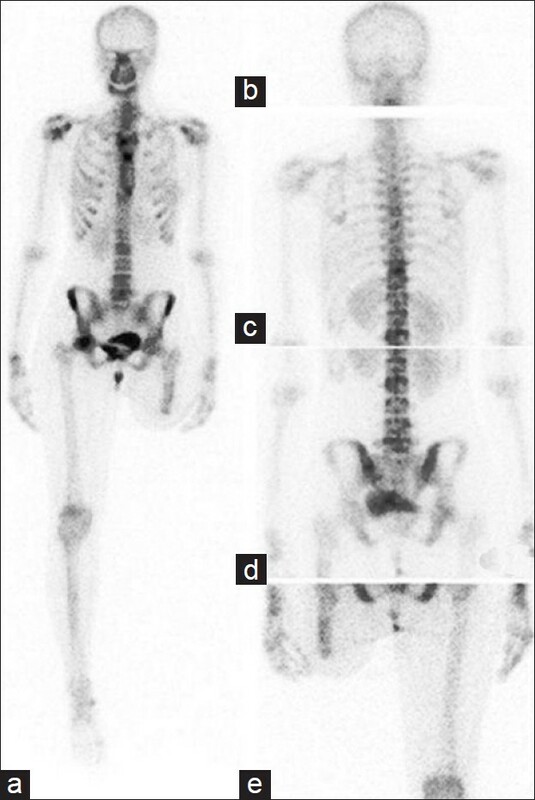 A 55-year-old female diagnosed with a large, well-differentiated, non-functional neuroendocrine carcinoma of pancreas, presented with abdominal pain of increasing severity. A contrast-enhanced examination of the abdomen was performed to reveal a large, diffuse, enhancing pancreatic mass with multiple filling defects within the mesenteric vasculature. We present findings on 68 Ga-labeled [1,4,7,10-tetraazacyclododecane-1,4,7,10-tetraacetic acid]-1-NaI 3 -Octreotide, positron emission tomography-computed tomography ( 68 Ga-DOTANOC PET/CT) and the importance of somatostatin receptor-based PET imaging in such patients. Distant soft tissue metastasis and the simultaneous presence of iodine concentrating and nonconcentrating lesions in papillary thyroid cancer are extremely rare. 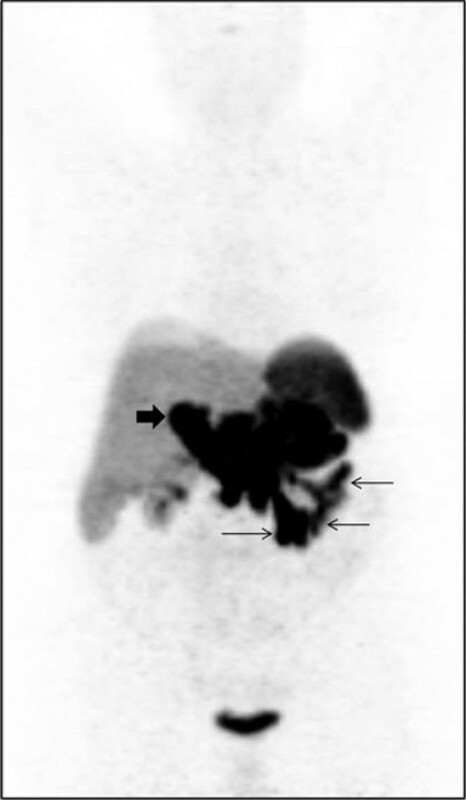 The concerned patient, a histopathologically proven case of papillary thyroid cancer with nodal metastases treated with total thyroidectomy, bilateral cervical nodal dissection, and radioablation, subsequently developed lung, muscle, and liver metastasis. Triggered by increased thyroglobulin, the iodine-131 whole body scan and 200 mci iodine-131 post-therapy scan showed a left gluteus maximus lesion and a liver lesion. 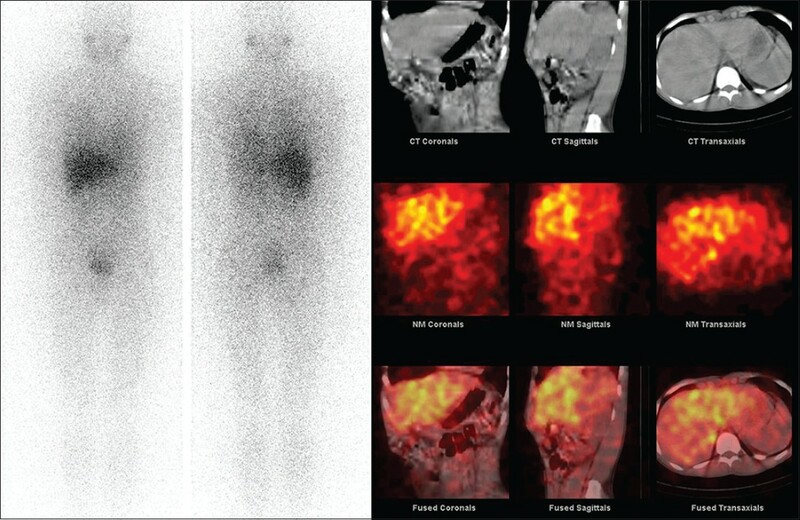 Fludeoxyglucose (FDG) positron emission tomography-computed tomography (PET-CT) scan intended to find additional lesions revealed iodine and FDG nonconcentrating bilateral pulmonary nodules and a single FDG avid hepatic and two muscle metastases. Although FDG concentration in metastatic pulmonary nodules is generally low, the CT characteristics were classical for metastatic lesion. 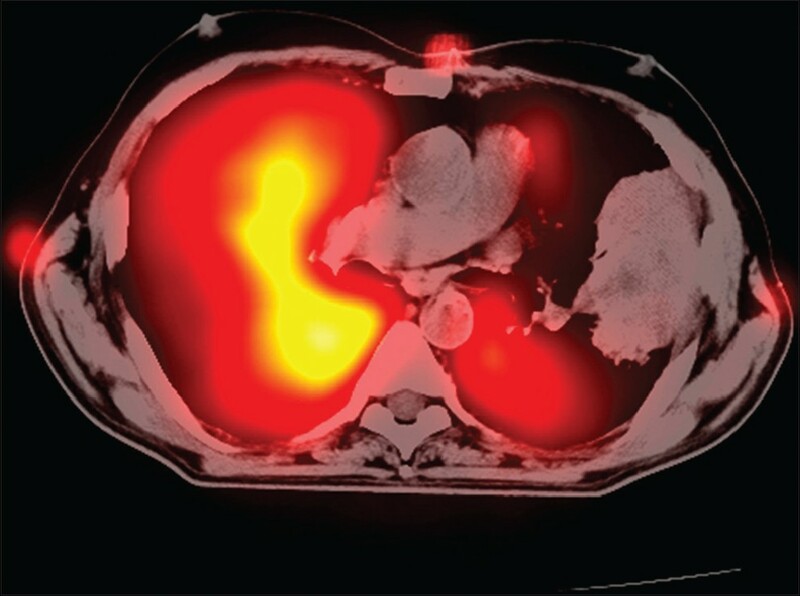 A follow-up FDG PET-CT study six months after 200 mci iodine-131 radioablation showed treatment response in muscle and liver lesions but not lungs. Uptake in non-osseous, non-urologic tissues is occasionally found in the performance of bone scintigraphy. These uptakes reflect an atypical interaction between the radiopharmaceutical and the patient. Knowledge of the rare extraskeletal uptakes and their clinical relevance helps in better interpretation of bone scans. We report an unusual occurrence of extraosseous accumulation of 99m Tc-methylene diphosphonate in a phlebolith in bone scan, confirmed with the aid of photon emission computed tomography and computed tomography. Adult onset Still's disease (AOSD) often poses a diagnostic and therapeutic challenge and clinical guidelines are lacking. 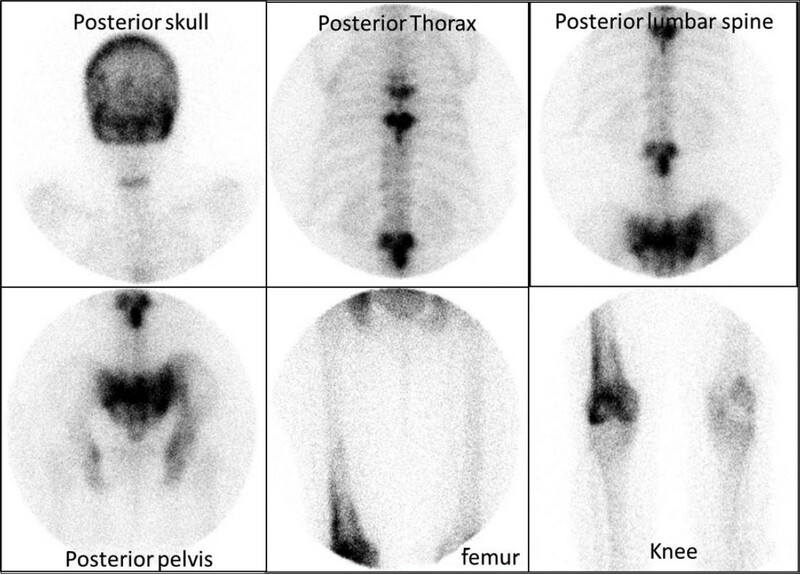 It is often diagnosed after a considerable delay; bone scintigraphy imaging may offer new imaging techniques for early diagnosis and successful therapy in follow-up examinations. We describe the liver and bone scan findings in a 21-year old female patient with AOSD, who had been having fever of high grade, recurrent and intermittent in character, associated with severe sore throat and joint pains. She had been extensively investigated for possible infectious disease. She had received antibiotics and antimalarial drugs without any response. Clinical manifestations of Nephroptosis are ubiquitous. Diagnosis is achieved after ruling out all other causes of abdominal pain by investigations. However, Nuclear Scan with Tc-99m GHA, MAG 3 and DTPA renal agents with dedicated imaging in supine and erect postures confirms the diagnosis5. Not only as a diagnostic aid, it also helps in decision making for surgical correction by depicting the changes in drainage and GFR in different postures. 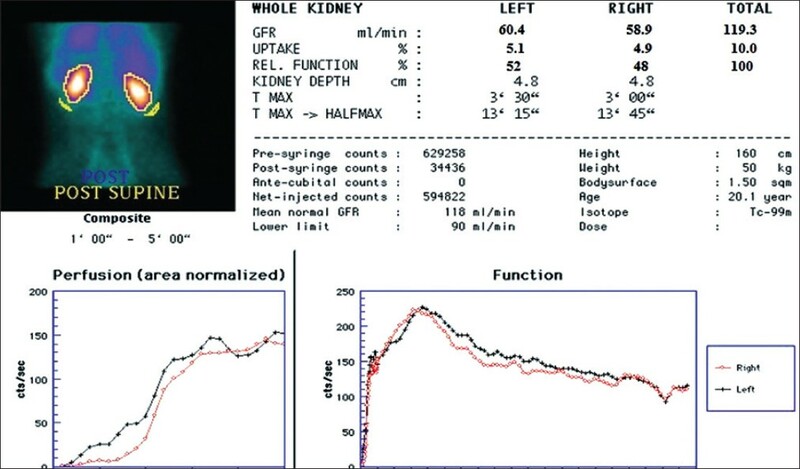 We describe a case of Nephroptosis where DTPA Renal Scintigraphy addressed the diagnostic and therapeutic issues in the case. 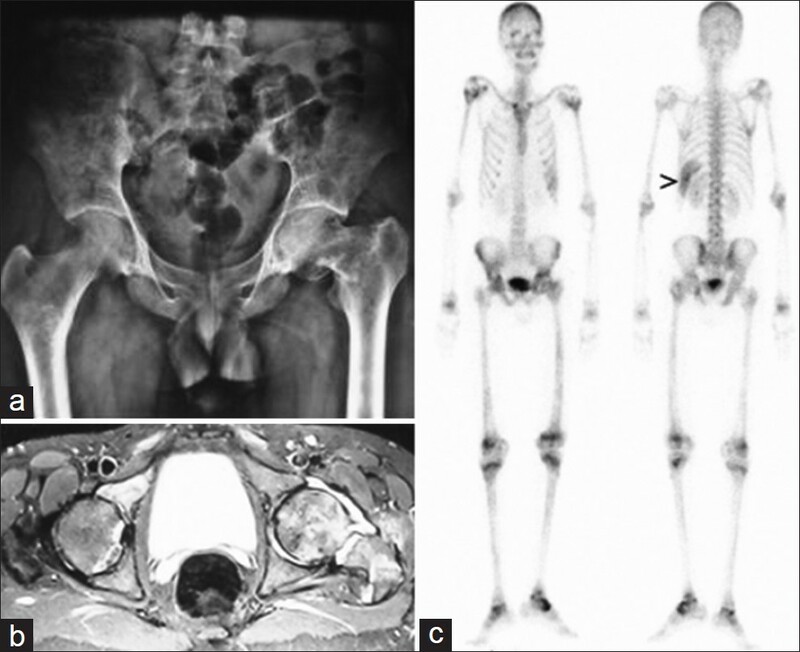 Skeletal manifestations are common in hematologic disorders. Benign entities such as Sickle cell disease develop microvascular embolization causing skeletal crisis. Leukemia, acute myeloblastic or lymphoblastic may develop bone marrow infarcts. Compromised immunity makes them susceptible to secondary infection leading to osteomyelitis or septic arthritis. 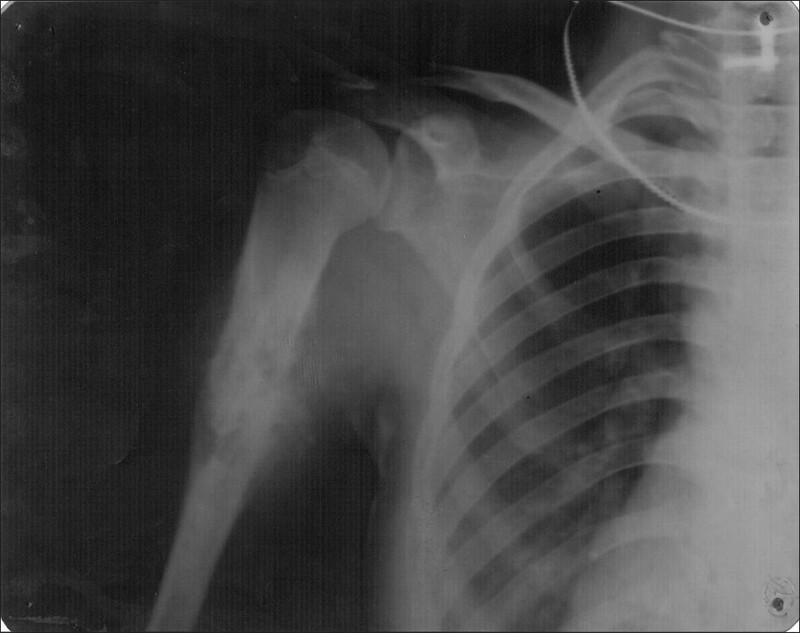 Exposure to steroids may lead to osteonecrosis in these cases. Presented here is an atlas of various scintigraphic skeletal manifestations encountered over the past 10 years, in hematologic disorders.